Holika Dahan is a great ritual of the Hindu religion while celebrating the holi festival. It is a tradition festival which celebrates the Holika death and Prahlad safety by organizing the ceremony known as the Holika Dahan. This ceremony held according to the Muhurt by Hindu calendar which specially falls during night or late evening. It is a religious ceremony during which people roast the “Jau” in the fire of Holika and bring them to their home for the goodness of the family members. They burn 5 “Upali” in the fire as well in the myth of burning their all problems. Some people burn the waste of massage by the “Sarson Ubtan” in the fire in the myth of burning their all body problems and get blessed by the good health by the Holika Mata. There are various mythological explanations which have been given in the historical books for the death of Holika and celebration of the Holi. Holika was burnt as Vishnu stepped in, She was booned the Brahma for never being harmed by the fire, she was just following order of her brother and knew everything, she had given her fire protective clothe to Prahlad and died herself, when it was firing Prahlad started praying Lord Vishnu then the fire protective shawl flown away to wrap the Prahlad from the Holika and so many reasons. The date of Holika Dahan in 2019 is 20th of March, at Wednesday. The complete duration of Holika Dahan in 2019 is 3 hours and 35 min. The timing of Holika Dahan will start from 08:57 PM to 12:34 AM. There is a great history behind celebrating the holi festival as well as burning Holika as Holika Dahan. Holika was a sister of the demon King, Hiranyakashipu and aunt of the Prahlad. The story of Holika Dahan is made around the Holika death and safety of Prahlad which indicates the victory of good power over the evil power. According to the Hindu mythology, a long ago there was a demon king, Hiranyakshyap having very powerful desire to be eternal always. In order to fulfill his dreams, he started doing Tapa of the Lord Brahma. One day he became successful and booned by the Brahma to be eternal and powerful man on the earth. He was booned for the five special powers such as; neither he could be killed by any human being nor by any animal, neither he could be killed inside the door nor outside the door, neither he could be killed in day nor in night, neither he could be killed by any Astra nor by any Shastra, neither he could be killed on the land nor in the water or and air. Just after getting booned by such powers he started understanding himself superman of the earth and more than God. He wished to be only worshiped as a God by the people. He started punishing and killing people who were not accepting his orders. His son, Prahlad has also opposed his father orders and refused worshipping him as a God instead continued worshipping the Lord Vishnu. Because of such as activities of his son, Hiranyakshyap became very angry and thought to kill his son. After a lot of attempts failed, he took helps from his sister, Holika. His sister was booned by the Lord Brahma for never being harmed by the fire and she had a special fire protective garment. She was ordered by her brother to sit in the fire with his son, Prahlad to kill him. However, as soon as the fire was roared, the special protective garment of the Holika flown away to cover the Prahlad. In this way, Prahlad was saved and Holika was burnt and died forever. After getting failed his next attempt of killing his son, Hiranyakshyap became very angry and tried another terrible attempts. Once, he tied his son to a pillar and said that call your Lord to save you. Prahlad said that my Lord exists in everything, even in this pillar. His father started laughing and soon Lord Vishnu came out of the pillar in the form of Narasimha (first half lion and other half human) in front of him, saved Prahlad and run towards Hiranyakshyap. Lord Narasimha caught Hiranyakshyap at a doorstep and killed him by his big and sharp nails. When he died, it was dusk (means neither day nor night), doorstep (means neither inside the door nor outside the door), lap (means neither land nor water and air), killed by lion claws (means neither Astra nor Shastra) and Narasimha (means neither human being nor animal). In this way, Prahlad was saved by his Lord and became the king of his demon power free kingdom. This story indicates that, truth and good power would always win over the false and evil power. 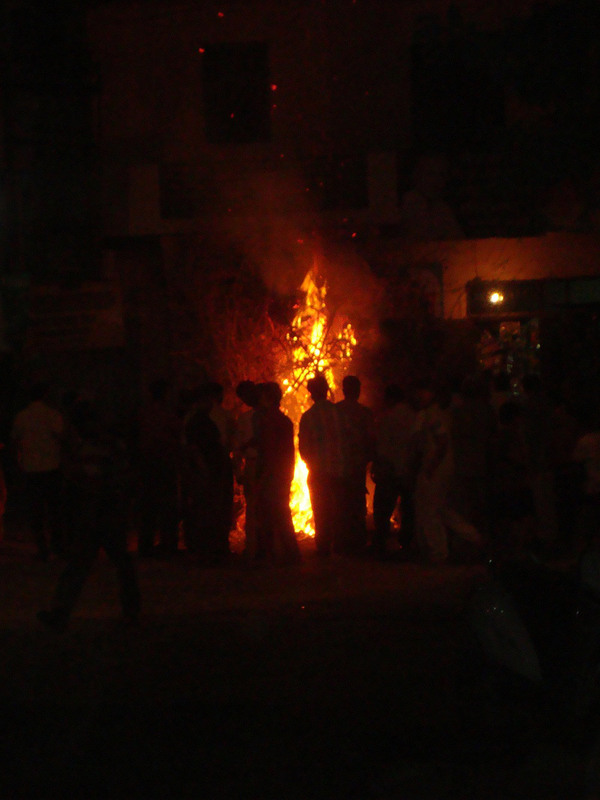 At some places of the country, holi is celebrated by burning Pootana or Putana instead of Holika. Once, there was a demon king called Kansa (uncle of Krishna) had fear of his life from getting killed a day by the Lord Krishna. He sent her demon Putana to kill Krishna through her poisonous breast milk. She came to baby Krishna and started feeding of her poisonous milk. Baby Krishna started sucking forcefully and she felt a big pain and came in her original form. Finally she died and baby Krishna was saved but got dark blue skin color. From then, people started celebrating Phagwah by burning the Putana. Because of his dark skin he always despaired of the fair skinned Radha and Gopikas. On the day of Holi celebration, because of his desperation his mother asked him to go near Radha and color her face into any color. After doing that both of them became good friend and couple. To commemorate that event, people play holi every year by coloring the face of each other. 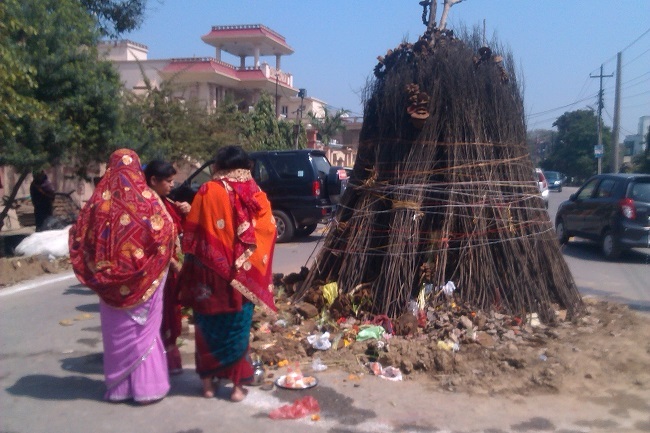 Married women perform a ritual in the afternoon before the Holika Dahan. They take bath and prepare a puja thali for worshipping the Holika. Puja thali contains Roli, Haldi, Wheat flour, 5 co-dung uple having hole, mauli (red thread), Jal and 5 or 7 jau bali. Women perform this puja of Holika for the wellness and bright future of their kids. 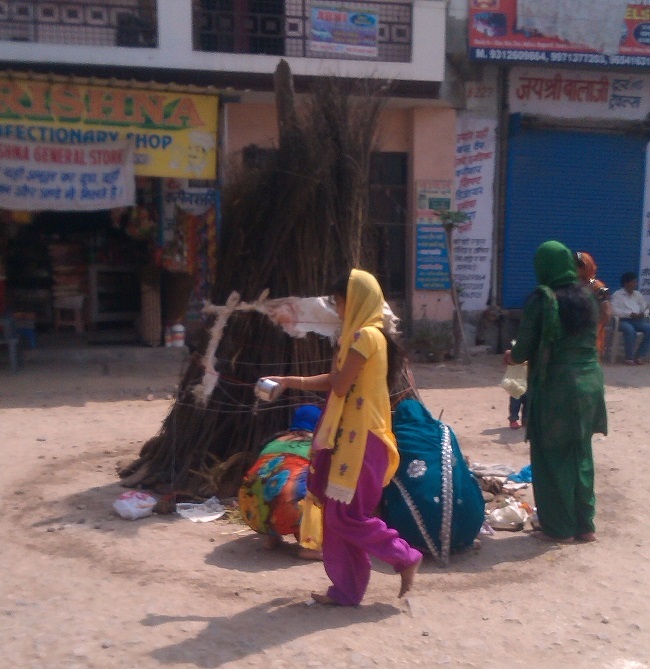 They make round of the Holika heap collected on the crossroads in the nearby regions. They offer jal to the Holika while making round for 5 or 7 times. They also offer red thread while making round for 5, 7 or 11 times of the diameter of the Holika. There is a great significance of offering haldi powder, wheat flour powder, jau bali and co-dung uple for the wellness and long life of the kids. By offering many things to Holika women seek blessing for the prosperity and health for the whole year in their home. Some women bring roasted jau bali to their home by roasting the raw jau bali in the fire of Holika during Holika Dahan in evening in the myth that all the negative energies and diseases of home gets burned with Holika. There is also a tradition of offering a new clothe or sari to the Holika when any woman give birth to the son. Later the clothes are taken by the Pandits or priests of region. 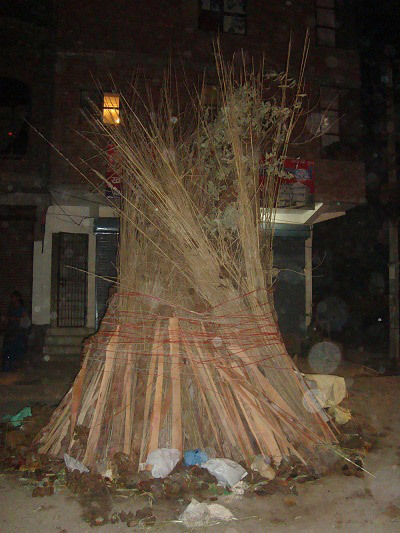 This is a big heap of light and heavy woods and co-dung cakes collected by the people in the mid of the crossroads for the purpose of Holika Dahan. People would get together here at the time of Holika Dahan in the evening to celebrate the ritual of Holika Dahan. Nearby people of the colony are gathered here to flame the collected big heap of woods at the crossroad as Holika Dahan in the myth of burning Holika by having safe Prahlad in her lap.